The Pink Legacy a 18.96 carat rare fancy vivid pink emerald cut vs1 diamond type IIa, sold at Christie's Magnificent Jewels auction on November 13th, 2018, the marvelous rare pink diamonds was purchased by Harry Winston. The New York based retailer claimed by the Swatch Group set a world record cost for the 18.96-carat extravagant clear pink jewel, buying it for 50,375,000 Swiss Francs, about the comparable to $50-million. Instantly after the deal, Harry Winston's CEO Nayla Hayek, girl of the late Swatch author Nicolas Hayek, renamed the stone The Winston Pink Legacy. The phenomenal diamond once claimed by the Oppenheimers, the family behind the DeBeers precious stone organization. A cut-cornered rectangular step-cut fancy intense blue diamond weighing 3.47 carats set a price-per-carat world record for a blue diamond after it sold for $1.9-M/carat to reach almost $6.7-M at Sotheby’s Magnificent Jewels Auction. The gem’s final price nearly 3X’d Sotheby’s (NYSE:BID) pre-sale estimate of between $2 and 2.5-M and pushed up the auction final results to $26.2-M. The blue stone was previously owned by an anonymous Midwestern family. In total, the fine jewelry broker garnered $34-M across its New York Spring auctions Sotheby’s said in an e-Mail. According to Sotheby’s, buyers from all over the world flooded New York emptied their wallets by acquiring a 72.96-carat diamond bracelet for $1.4-M and a 13.70-carat Tiffany & Co. (NYSE:TIF) diamond ring for $1.2-M.
L.J. West Diamonds launches the Australian tour of the Scott West jewellery collection in collaboration with Linney’s and Calleija with in-store debuts of the Argyle Violet and Argyle Thea. Thursday, October 12, 2017: New York. – Scott West by L.J. West Diamonds announces the Australian Pink Diamond Tour for the month of October to debut the largest collection of exquisite fancy coloured diamonds and diamond jewellery ever publicly exhibited in the Southern Hemisphere and will make its international debut at luxury jewellers Linneys Perth & Calleija Marina Mirage, Main Beach, Gold Coast, Australia. The first stop will be in Western Australia at Linneys Crown Metropol showroom, the collection will be unveiled for the very first time from 13 – 15 October, before traveling to Sydney for private viewings and to Calleija’s Gold Coast location. Featuring the finest coloured diamonds from the Argyle diamond mine and across the globe, this exclusive showcase represents rarity never before seen. Its presence in Perth, Sydney and Gold coast places Australia firmly on the map of fine jewellery destinations. The collection includes more than 60 fine jewellery pieces and important fancy coloured diamonds. The Argyle Violet™, an incredible gem, which was the Hero stone of the 2016 Argyle Tender, is the highlight of the collection. The Argyle Violet, a 2.83 carat Fancy Deep Greyish Bluish Violet diamond recovered from Rio Tinto’s Argyle mine in the east Kimberley region of Western Australia, is now in a stunning piece of jewellery surrounded by vivid pink diamonds fresh off it’s exhibition at the Museum of Natural History in Los Angeles. The collection also features the Argyle Thea™, a 2.24ct Fancy Vivid Purplish Pink diamond which was a signature diamond from the 2016 Tender now set in a classical platinum ring designed by Scott West. Linneys Director David Fardon commented “We are delighted to present such a significant collection of coloured diamond jewellery to our clients and this is the first time in Australia we have seen a jewellery collection valued in excess of $100 million.” The rare pink diamonds from Argyle are highly collectable and have continued to appreciate as the mine moves closer to the end of its mine life. Rio Tinto has unveiled the largest Fancy Red diamond in the history of its Argyle Pink Diamonds Tender, during a world exclusive preview in New York. The 2.11 carat polished radiant cut diamond, known as The Argyle Everglow™, is the dazzling centrepiece of the 2017 Argyle Pink Diamonds Tender – an annual showcase of the rarest diamonds from Rio Tinto’s Argyle mine. Unprecedented in size, colour and clarity, The Argyle Everglow™ has been assessed by the Gemological Institute of America (GIA) as a notable diamond with a grade of Fancy Red VS2. In the 33-year history of the Argyle Pink Diamonds Tender there have been less than 20 carats of Fancy Red certified diamonds sold. The 2017 Argyle Pink Diamonds Tender is named ‘Custodians of Rare Beauty’ in honour of its rich provenance and honourable pedigree. The 58 diamonds in the Tender weigh a total of 49.39 carats – including four Fancy Red diamonds, four Purplish Red diamonds, two Violet diamonds, and one Blue diamond. The 2017 Argyle Pink Diamonds Tender will be showcased in New York, Hong Kong and Perth with bids closing on 11 October 2017. The Oppenheimer Blue became the most expensive gemstone ever sold at auction in 2016. At 14.62 carats, the breathtaking Oppenheimer Blue — named after Sir Philip Oppenheimer of De Beers fame — is the largest Fancy Vivid Blue ever to come to auction. 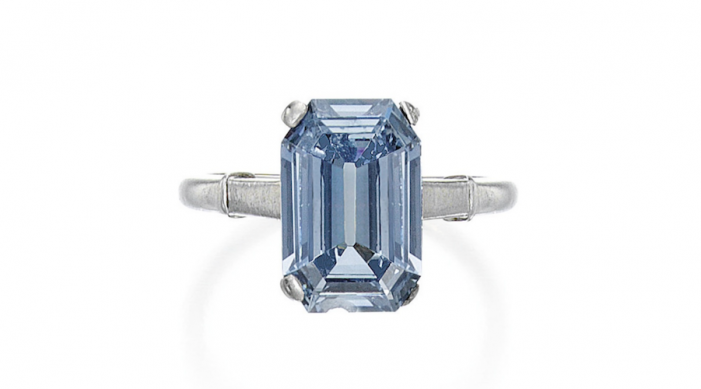 It is the latest in a line of historic blue diamonds to have been auctioned at Christie’s which includes the Tereshchenko in 1984 and the Wittelsbach Blue in 2008. Since they were first discovered in India, pink diamonds have been considered among the most beautiful of gemstones. At 14.23 carats, The Perfect Pink is particularly rare, with polished pink diamonds of its size and colour virtually unheard of — fewer than 10 per cent of all pink diamonds weigh more than 0.20 carats. While most pink diamonds show some elements of purple, orange or grey, The Perfect Pink is just that, showing absolutely no trace of secondary colour. Completely devoid of inclusions, the diamond was sold in Hong Kong in 2010 for $23,274,064. This exceptional gem possesses a soft cushion-shaped silhouette with modified cutting style, and is a sensational example of a Fancy Vivid Yellow diamond. Simply set as a ring within a streamlined yellow gold setting, the Fancy Vivid Yellow diamond requires no further ornamentation. To find a stone of approximately 75.56 carats graded a Fancy Vivid Yellow by the GIA is a rare occurrence in today’s marketplace. Termed ‘fire diamonds’ by famous gemologist Edwin Streeter, pure orange diamonds remain incredibly rare, with so few having been graded that the exact cause of their colour remains a mystery. The diamond’s unique nature was reflected in its price, selling for $35,543,804 — more than $15 million above its high estimate. 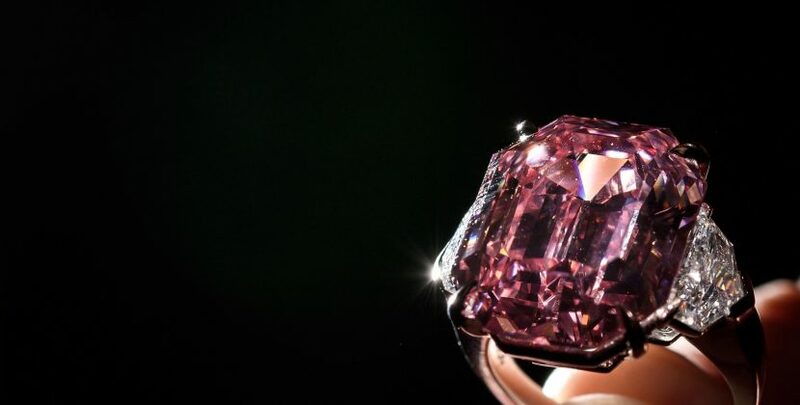 Sold in Geneva on 10 November 2015, this cushion-shaped Fancy Vivid Pink diamond is the largest of its kind ever to come to auction, weighing in at 16.08 carats. The stone is set in a ring, and is surrounded by a double row of pavé white diamonds, a third row of small pink diamonds nestled underneath. ‘As large and rare coloured diamonds of this calibre become increasingly hard to locate, this 16.08 carat Fancy Vivid Pink diamond comes to market at a time when great gems are mirroring prices achieved for masterpieces in the world of fine art,’ comments Kadakia. Awarded to just one in 100,000 diamonds, the ‘Fancy Vivid’ status is exceptionally rare, reflecting the depth of the diamond’s straight pink hue. Weighing in at 13.22 carats, The Blue was sold as the largest Flawless Fancy Vivid Blue diamond in the world. Set in a ring, the pear-shaped stone came flanked by two pear-shaped white diamonds, weighing approximately 1.00 and 0.96 carats. It was purchased by Harry Winston in Geneva in 2014 for a sum equating to just over $24 million. ABC News - Sotheby's sold a pair of pear-shaped diamond earrings at a hammer price of about $51 million Tuesday, though the 14.54-carat flawless Fancy Vivid Blue diamond that was the auction's highlight fell short of the expected range. Sold as separate lots, the "Apollo Blue" and "Artemis Pink" diamonds together cracked the low end of the expected range of $50 million to $70 million, but were a record for earrings sold at auction, Sotheby's said. The earrings were the standout offerings at a Geneva auction of nearly 400 pieces of jewelry that reaped more than $150 million altogether. At the hammer price, excluding fees, the Apollo Blue — the largest internally flawless Fancy Vivid Blue ever sold at auction — went for 37 million Swiss francs ($37.5 million), Sotheby's said. The total cost was $42.1 million, including the "buyer's premium." Auctioneer David Bennett, chairman of Sotheby's international jewelry division, called that a "very healthy price." The matching, 16-carat pink diamond went for a hammer price of about $13.5 million. Overall, the pair went for a total, including fees, of more than $57 million. Bennett declined to identify the buyer who snapped up both lots, but the auction house did say the buyer was renaming the gems as "The Memory of Autumn Leaves" for the blue diamond earring and "The Dream of Autumn Leaves" for its pink sister. A Sotheby's employee displays the Apollo blue diamond and the Artemis pink diamond earrings during a preview at the Sotheby's, in Geneva, Switzerland. Sotheby's sold a pair of pear-shaped diamond earrings at a hammer price of about $51 million Tuesday, May 16, 2017, though the 14.54-carat flawless Fancy Vivid Blue diamond that was the auction's highlight fell short of the expected range. A diamond as rare as you. For centuries, natural color diamonds have been regarded as the world’s most sought-after gems, from collectors to royalty. Diamonds so rare that they are only discovered in a few locations on earth, they are likened to works of art, hidden treasures and rare books. One of the exciting factors involved in natural color diamonds is the origin of how they get their unique colors, where they are found and why they are so unique. Rare Multi-Color Diamonds part of the L.J. West Diamonds collection. Tiny amounts of nitrogen created yellow and orange shades. The element boron created blues. Hydrogen causes the color violet to appear. Tremendous pressure occasionally would realign or spiral the diamond’s crystal structure, creating red, pink, purple and brown diamonds. Millions of years of natural radiation produced green diamonds. Color diamonds have been around since the beginning of diamonds discovered approximately 3000 years ago in India; it is only the last decade where the desire and appeal for them have entered the consumer market. The growing awareness of rarity and value have created increased demand for natures most special diamonds At auction natural color diamonds are exceeding record prices with the 14.62 carats Oppenheimer blue diamond selling for an impressive $57,541,779 USD at Christie's in May of 2016. This blue diamond was the largest vivid blue diamond ever to sell at auction and holds the current record for highest price paid for any jewel at auction. In 2014, the 12.03 fancy vivid blue “Blue Moon of Josephine” diamond sold for $48.4 million and still holds the current price per carat record for any public sale at auction at $4 million per carat. In 2015, a collector paid US$28,523,925.00 for a 16.08 Fancy Vivid Pink Diamond, setting a new world record for the highest price paid and highest price paid per carat at $1.773,875.00 for a Fancy Vivid Pink diamond. These values highlight the exceptionally rare stones but are proven examples of the desirability for them. 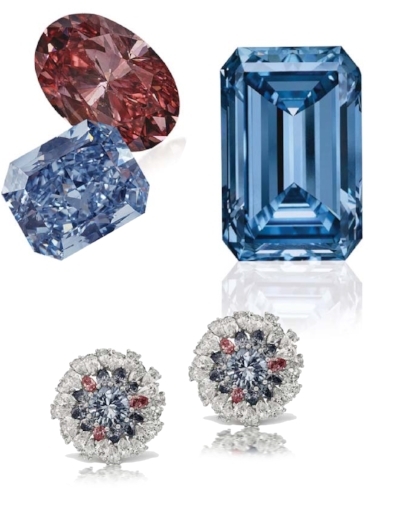 The 14.62 carats Oppenheimer Blue Diamond (right) $57,541,779 USD at Christie's in May of 2016, Scott West Patriot Earrings (bottom) featuring rare Argyle Pink and Blue diamonds. Any buyer or collector has a spectrum of color to select from in natural colored diamonds, and there is no right or wrong in choosing what diamond can appeal to your taste. Prices for natural color diamonds can start from $100 up to $1 million per carat plus, the characteristics in determining a stones value can vary with the exceptionally rare stones being valued by rarity, size and color. However, the main reason to own any is all the same – beauty, is the ultimate reason to own a natural color diamond! A natural color diamond is as rare as you, no color is the same and no diamond is alike. The diamonds can be compared to the endless variety of flowers on our earth, a colorful rainbow in the sky and the unique personalities found all around the world. Consider finding a color diamond that is as distinctive and alluring as you are. You will not be disappointed in your quest to do this. (CNN) Relatively small, but slowly and perfectly formed over billions of years, the Argyle Violet diamond is so rare in color that it has its own unique diamond classification: "Fancy Deep Grayish Blueish Violet." It was "a once in a lifetime discovery. I fell in love with it. We had to have it," says Scott West of L.J. West Diamonds Inc. of New York. Like his father, Larry, and his grandfather Max before him, West is a diamond hunter, searching for the rarest and most unusually colored stones. His most recent acquisition, the 2.83-carat oval Argyle Violet is being displayed as part of "Diamonds: Rare Brilliance" at the Natural History Museum of Los Angeles County. Scott West spends three months every year traveling the world looking for special stones. The Argyle Violet came from the remote Argyle Mine in North West Australia. Every year for the last 30 years, the mine's owner, Rio Tinto, has invited a select group of buyers to tender for newly discovered stones by sealed bid. It's said to be the most exclusive diamond sale in the world. This year, there were 63 diamonds on offer, all pink, red or violet. West says he and his father, Larry, first saw the Argyle Violet in a secure room in Hong Kong in September, and made "multi visits in differing light" before placing their bid in November. He declined to comment on a Financial Times report that L.J.West's winning bid was more than $10 million for the Argyle Violet and 15 other colored stones, although he did agree that it was "tough" having to make a sealed bid. L.J. West claims to have the largest inventory of large colored diamonds in the world with some 2000 stones of all colors, many of them pink. But, naturally, West remains discreet about money and collectors. Though the company did admit that Halle Berry wore one of their diamond rings (the Pumpkin Diamond, Fancy Vivid Orange, 5.54 carats) when she won her Oscar in 2002. "The Middle East is a strong market. China continues to grow. The United States is still the strongest market of all," he says. More than 40 pieces of priceless diamond jewelry in the weekend in San Gabriel Changxing jewelry watches and clocks gold line display, so that the Southern California Chinese community Christmas and New Year shine. One of the top Zhenhan pink diamond ring up to 14 million yuan, a rare. "The reason why the Southern California Chinese community chose to display these top treasures, because the Chinese people know a lot of goods," from New York's third generation descendant of the jewelry family Scott West, 50 years ago, we know the diamond is usually pink And blue, and now hope to all the world's top diamond, are introduced to the Chinese community. The 3000 family of diamond jewelry offered by the West family will be on display at the Los Angeles County Museum of Natural History from this weekend until March 2017. Aaron Celestian, deputy curator of the museum, said the Natural History Museum held very few diamond exhibition, this is the largest diamond exhibition in recent years. The last diamond exhibition in 2014, "was only a diamond jewelry display." Celestian, who works on diamonds and jewels, says that 99% of the museum's diamonds are white, because white is the most traditional and likable. "But it's not the color diamonds that are not popular, It is too rare and rare, very difficult to find. Yellow, pink, blue, green, red, purple, orange and other colors, including yellow diamonds are often experts called "very rare"; powder , Blue and green diamond as "extremely rare"; red, purple and orange drill for the "top Jane Han." Celestian said that the color of diamonds is usually divided into light color, color, rich color and brilliant color four levels, the heavier the color, the more valuable. "Celestian said," color diamond jewelry color, two look at the size of three to see cut. He explained that the natural color diamond is precious, because very rare, the production environment at least a few miles below the surface, but also requires very special temperature and light conditions. Changxing Jewelry gold line, said that although this rare diamond display only two days, but Changxing CEO Valerie Lee as a license gem identification division, ready to provide gemstone identification for the public. At the same time, Changxing also have these top diamonds of the drawings and description, ready to help interested people back to the real parts, so that buyers see. At the exhibition’s center is the “Juliet Pink Diamond,” an extremely rare pink diamond of more than 30 carats, and a Fancy Deep Grayish Bluish Violet named the “Argyle Violet Diamond,” after the Argyle mine in Western Australia where it was discovered in 2015. Through examples, such as the fluorescent lighting of a “Rainbow” diamond necklace and a very rare Victorian Orchid Diamond, the exhibition will attempt to bring to light the rare properties of colored gemstones, the science behind natural colored diamonds, and how the interplay of light and chemistry gives diamonds color. The Diamonds: Rare Brilliance exhibition will open Friday and run through March 19, 2017. The colored gems and jewels in the exhibition are owned by L.J. West Diamonds, which specializes in the sourcing, manufacturing and distribution of colored diamonds. The exhibition coincides with the reopening of NHMLA’s Gem and Mineral Store. New York, November 28, 2016 — The Natural History Museum of Los Angeles County (NHM) today announced details for its coming exhibition Diamonds: Rare Brilliance, which will bring together rare colored gems never before seen in the United States inside the museum’s renowned Gem and Mineral Hall. At the center of Rare Brilliance will be the “Juliet Pink Diamond,” which is an extremely rare pink diamond of over 30 carats, and a Fancy Deep Grayish Bluish Violet named the “Argyle Violet” after the eponymous Argyle mine in Western Australia, where it was discovered in 2015. Through stunning examples, such as the fluorescent lighting of a “rainbow” diamond necklace and a very rare Victorian Orchid Vivid Purple diamond, the exhibition will bring to light the rare properties of colored gemstones, the science behind natural colored diamonds, and how the interplay of light and chemistry gives diamonds color. Organized in partnership with L.J. West Diamonds, Rare Brilliance will be on view from December 16, 2016, through March 19, 2017. “Throughout history diamonds have been synonymous with love and romance. The Juliet Pink captures this connection with its vibrant, strong pink color that is both alluring and seductive. After understanding the stone’s importance and color we decided to name the stone the ‘Juliet Pink Diamond,’ as the stone captivates passion and ultimate beauty.” – Scott West, the vice president of L.J. West Diamonds. The Juliet Pink Diamond, which will be set in a necklace with marquise, pear and round-cut white diamonds totaling 98.70 carats for the exhibition, has been designated a type IIa diamond by the Gemological Institute of America (GIA) for its remarkable chemical purity and clarity. Natural colored diamonds are a strikingly rare phenomenon, occurring in an estimated one out of every 10,000 gems, and the precise science behind individual colors remains a mystery. In addition to the Juliet Pink Diamond, Diamonds: Rare Brilliance will introduce U.S. audiences to one of the world’s rarest diamonds — a Fancy Deep Grayish Bluish Violet named the “Argyle Violet” after the Argyle mine in Western Australia. There are no other known diamonds of this combination of colors or with the same clarity and size, and it is the largest Violet to be discovered in the Argyle Diamond Mine. The 9.17 original rough stone was an unusual shape characterized by deep grooves and an uneven surface. After more than 80 hours of carving and polishing, the diamond on view in NHM’s Gem Vault is a 2.83-carat oval that is set in a designer ring surrounded by Argyle Vivid Pink Diamonds. The world-renowned, 6,000-square-foot Gem and Mineral Hall at NHM opened in 1978 and is one of the finest permanent exhibit halls of gems and minerals in the world. The Hall houses a selection of the Museum’s extensive collection — displaying more than 2,000 spectacular specimens within two large galleries — which as a whole includes more than 150,000 specimens and is the largest in the western United States. The NHM Mineral Sciences Department curates the museum’s world-class collection of minerals, rocks, gems, ores, and meteorites, and it conducts research focusing on furthering scientific understanding of these materials. The department actively maintains the Gem and Mineral Hall and provides general and scientific programming through the Museum’s Gem & Mineral Council. 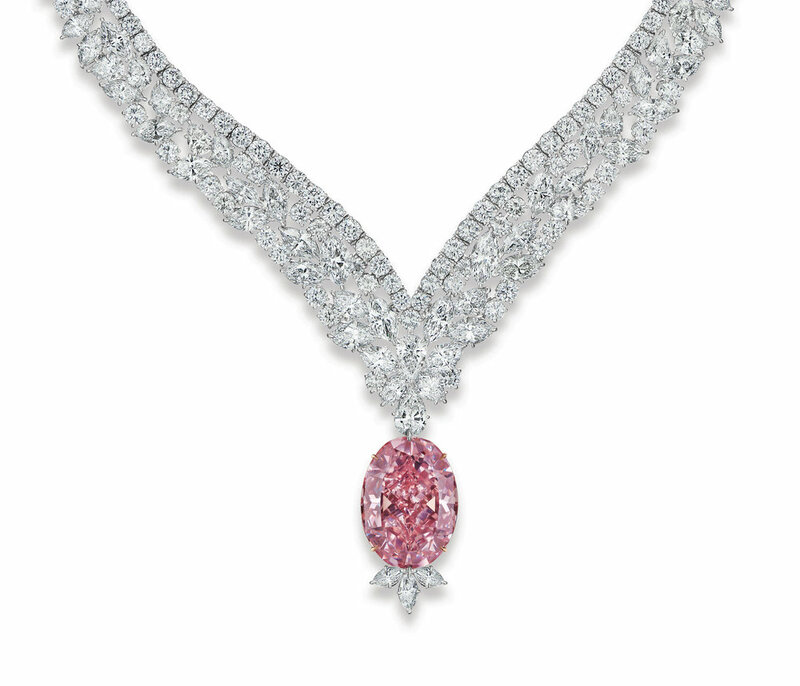 The Juliet Pink Diamond – The exceptional gem is a Fancy Intense Pink diamond, VVS2. Cut from an estimated 90-carat rough from South Africa, the rare gem is fashioned in an oval-cut shape at a noteworthy 30.03 carats and is set in a magnificent necklace with marquise, pear and round-cut shape white diamonds, VVS E-F totaling 98.70 carats. The Argyle Violet – an historic diamond, the its 2.83-carat oval shape is making it the largest violet diamond unearthed from the Argyle diamond mine, polished from an extraordinary 9.17-carat rough diamond. An impossible rarity, the Argyle Violet possesses the unique color grading of Fancy Deep Grayish Bluish Violet, and it headlines the 2016 Argyle Pink Diamonds Signature Tender. The Rainbow Necklace – a glorious and brilliant design that features over more than 100 rare natural color diamonds from the vast color spectrum. The necklace features radiant-cut shape multi-color diamonds at a noteworthy 35.93-carat weight and is set in a custom, one- of- a- kind 18-karatK white gold arch necklace. The necklace took over 5 years to assemble as collecting the diamonds of similar shape and size was extremely miraculous occurrence. The Victorian Orchid Vivid Purple Diamond – The Victorian Orchid is an extremely rare gem; the diamond is one of the rarest stones currently worldwide because of– due to its unique color. The Victorian Orchid is a Fancy Vivid Purple diamond, SI2. This rare gem is fashioned in a cushion-cut shaped at a noteworthy 1.64 carats and is set in a flower designer ring with a match pair of kite- shape diamonds ofs 0.42 carats.platinum ring setting. Groups of 10 or more people receive discounted rates on Museum admission. Group tickets available now by calling (213) 763-3218 or by emailing groupsalesNH@nhm.org for reservations and more information. Tickets to the exhibition are free for NHM members. To become a member, visit nhm.org/membership. The Natural History Museum of Los Angeles County is located at 900 Exposition Blvd., Los Angeles. It is open daily 9:30 a.m. to 5 p.m. The Museum was the first dedicated museum building in Los Angeles, opening its doors in 1913. It has amassed one of the world’s most extensive and valuable collections of natural and cultural history — with more than 35 million objects, some as old as 4.5 billion years. The Natural History Family of Museums includes the NHM, the La Brea Tar Pits and Museum (Hancock Park/Mid-Wilshire), and the William S. Hart Park and Museum (Newhall, California). The Family of Museums serves more than 1 million families and visitors annually and is a national leader in research, exhibitions and education. The journey for L.J. West Diamonds spans over five decades and three generations, and it continues to this day. L.J. West has established itself as one of the world’s most distinguished houses for some of the most rare and important exotic Natural Fancy Color Diamonds to have ever been unearthed. Advocates for the collectors whose treasures we provide. L.J. West is an expert in every phase of the jewelry process – from sourcing to the cutting, polishing and final design. Each exceptional jewel is carefully set to become a unique work of art.